We ask your support for the Seventh Annual Jenni-Lyn Watson Memorial Golf Tournament. This year’s tournament will be held on Saturday, August 19, 2017, at FOXFIRE @ Village Green. 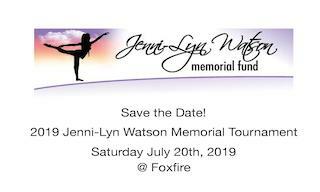 This is the only fundraiser for the Jenni-Lyn Watson Memorial Fund at the CNY Community Foundation, an endowed fund which distributes monies to enrich the dance community of Central New York. The 2016 tournament raised over $18,000. For more information about your tax deductible donation, click here! To make your sponsor payment, click on the following link or mail your check as mentioned in the information packet above. Questions? Email David Watson at dwatson@jenni-lyn-Watson.com.